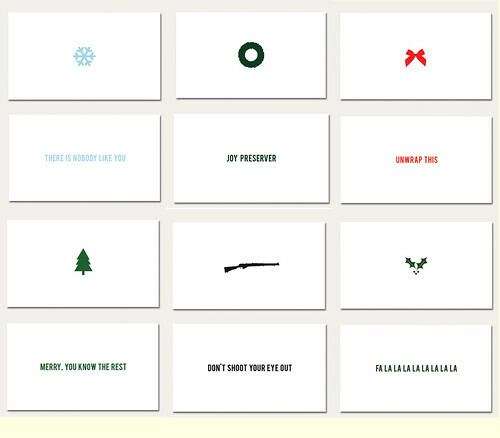 So it's that time of year and I couldn't resist making some holiday cards. 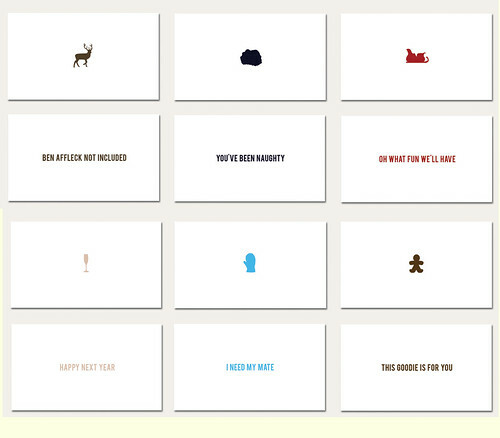 A while back I made a series of cards called Symbolims (that section on my website is temporarily defunct but you can see a few on Flickr), which were mini cards intended to simply state a sentiment to someone you love or hate. Well in the same vein I created a companion set. There are less images this go 'round however, with 12 unique cards. Each set will come with 24, so two of each, but if anyone happens to want individual cards or a few of one style I'm of course A-OK with that. In case you didn't know this already, I will sell you ANYTHING if you want it. Many of the cards, just like last time, are a little obscure or a far fetched connection (Ben Affleck anyone? ), but they are a representation of how my brain connects images to words. I don't get it, and I have stopped trying to. Hopefully some of them resonate with you though and will make a great companion to those gifts you will be (or not be) giving out. You can buy them here for $25.